Motorised Lifting Aids are products in the workplace like forklifts and other motorised lifting aids that are designed to move loads safely. It may seem an easy thing to use them yourself if the usual operator is not available. There are special rules and in some cases like forklift trucks, you must have a current licence. You may have used the machine in another job, but you cannot assume you can use now without approval from your manager. 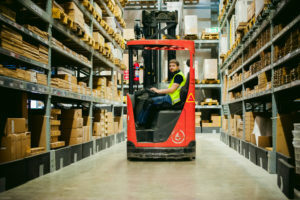 Forklifts and other machines can be very dangerous if used incorrectly by the user and those people around. There are special training and maintenance needed for machines, do not attempt to do repairs on them unless you are qualified and approved by your employer. If you are around where any mechanised lifting or moving aid is being used, keep at a safe distance, wear the correct PPE and follow your workplace policies and procedures. If in any doubt about any machine, ask your manager.